Arrange potatoes at the bottom of a slow cooker, then add carrots, followed by apple slices. Place the pork tenderloin on top. In a measuring cup, combine maple syrup, Dijon mustard, soy sauce, balsamic vinegar, and garlic. Pour the sauce over the contents of the slow cooker. Cover and cook on low for 6-8 hours. 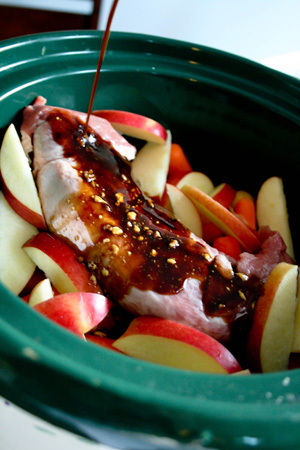 Remove meat, vegetables and apples from the slow cooker with a slotted spoon and keep them warm in a covered dish. Pour the juices from the slow cooker into a saucepan. In a small bowl, combine cornstarch and water. Whisk the cornstarch mixture into the juices in the saucepan. Bring to a boil continue to whisk until the gravy has thickened slightly. Slice the pork and serve with the carrots, potatoes and apples. Pour gravy on top.